The newest couple that explode the natural romantic kilig moment Jennylyn Mercado and Sam Milby for their first being a couple in the movie of The Prenup. 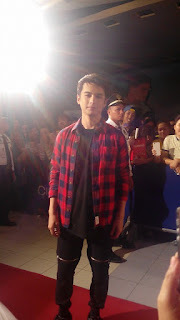 Last October 13 the long wait is over for SamJen, The red carpet premiere held in SM Megamall with a lot of SamJen fans together with the Regal Films Family. While the crowd waiting for the cast of The Prenup, There were fun games where they can participate and win the premiere ticket also there's a lot of artist who attend the red carpet premiere. 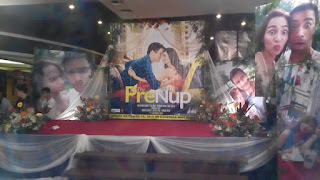 The Prenup movie is the story of the newest couple Wendy (Jennylyn Mercado) and Sean (Sam Milby) who meet in the road when both of their car are a little bit crashed but Sean settle it by giving a cash to the family of wendy, its just a wonderful destiny after their unexpected meeting they are both in the same plane. Wedding is come up after they agreed that they in love to each other. Going back in the Philippines, A little bit problem that they encounter for the both family. then the Prenup agreement goes to many sheet of papers.